Flat Roofing Solutions, save on energy costs, and no tear off. You get a lifetime of commercial roofing protection with our spray foam and silicone flat roofing solutions. You get superior weather protection, huge energy savings – as much as 50% a year on your annual energy costs. Please note: We do not perform residential roofing. Details such as square footage, building age, and the problems you're experiencing. Send Request for Free Quote! and the environment. Just ask for our flat roofing solutions. Spray foam and silicone roofing solutions are all seamless, and fluid applied. This protects your roof from needing to be torn off and replaced. 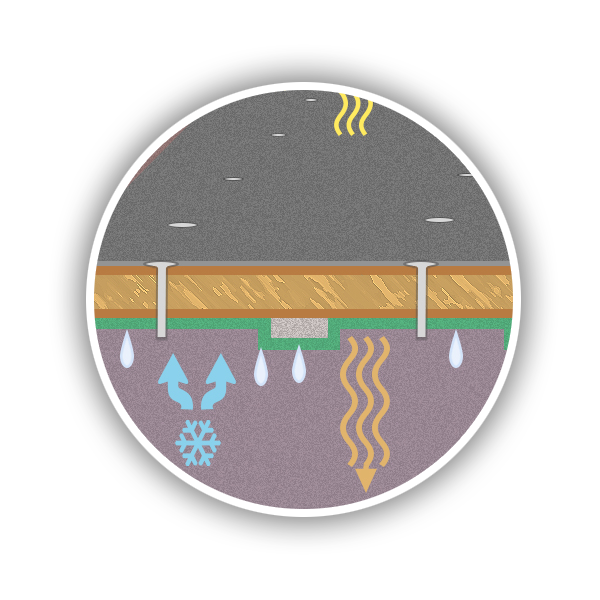 Our flat roofing solutions offer superior weather protection. Your flashing, and roof coverings won’t need to be replaced, extending your roof life indefinitely. Our spray foam solutions offer a seamless air barrier, that stops air from escaping through the roof. Your HVAC systems work less and provide a more comfortable experience. Stopping leaks is just a benefit in itself. But, if you own a building and lease to tenants, you could be saving yourself the cost of acquiring new tenants after a disastrous roof leak. Without any leaks, you won’t need to constantly replace ceiling tiles. Besides the labor of doing it, the materials are also expensive. Not to mention we’ll save you from having to cope with costly electrical problems from a leak. What’s this, no downtime? Yes, no downtime while we restore your roof. Since its fluid applied, we can resurface your roof without requiring that anyone leave the building. This means you don’t suffer from work stoppages or production downtown. You could see as much as a 50% reduction in your annual energy costs with Energy Shield’s Flat Roofing Solutions. With one or all of Energy Shield’s flat roofing solutions, you’ll be 100% protected from the harsh winter and summer weather conditions with superior insulation and roof coatings. With an Energy Shield Roof, the only thing dripping at 9 a.m. is the coffee pot. What happens? 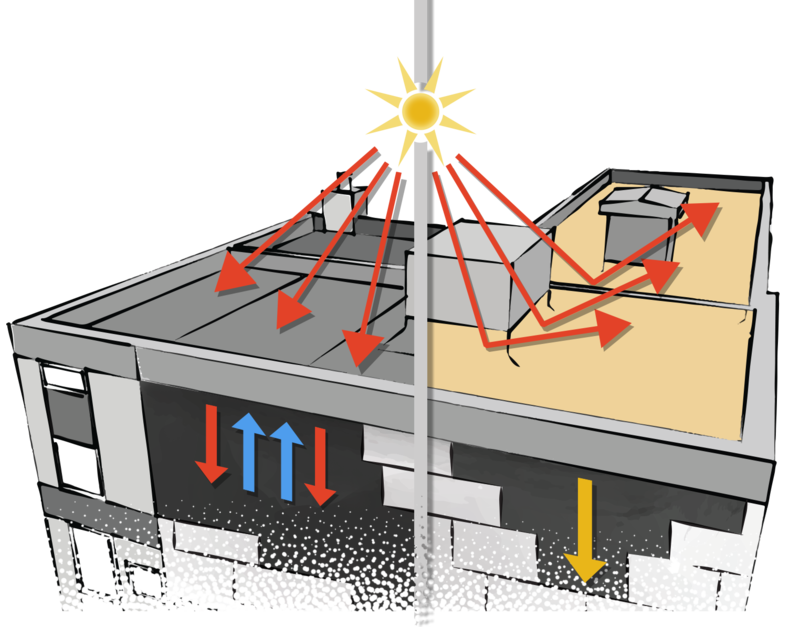 Dark colored roofs with board insulation and mechanical fasteners will heat up under harsh sun conditions. This causes the ambient heat to radiate through the cracks and seems, heating the inside of your building – in turn making your AC work harder. Our spray foam or silicone coating flat roofing solutions, are seamless and sprayed in place. With the light-colored, heat reflective insulator, and no seams, heat cannot get into your building and air cannot escape. It also eliminates moisture build-up and air loss; saving you tons of money year over year. Mechanically fastened holes and seams will expand and contract under normal weather conditions. The now bigger holes, cracks, and seams let water in and can destroy your roofing substrate. Air escapes through these cracks, holes, and seams, costing you thousands of dollars because your HVAC has to work harder to compensate for the air loss. The dark-colored roofing surface will transfer the heat to the inside of the building. And the harsh UV rays from the sun will degrade the surface leading to larger seams, holes, cracks, peeling and sagging. When the hot air heats up your roofing substrate and the inside cool conditioned air comes into contact with it, it will create condensation. That condensation will destroy your roof from the inside, and lead to leaks. 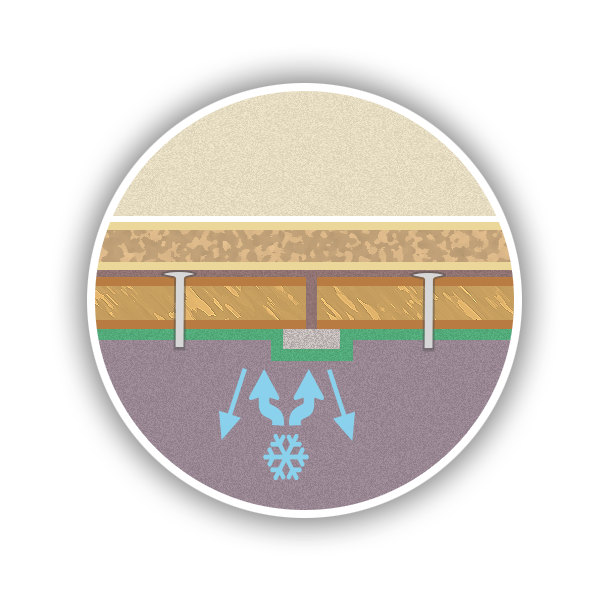 With our spray foam or silicone flat roofing solutions, all of the cracks and seams are filled and covered with a seamless, waterproof air barrier. The light colored spray foam or silicone coating will reflect the light cooling the roof and adds protection from all weather conditions, and the harshest UV rays. The cool inside conditioned air remains in your building, and can no longer escape through holes in the roof because the holes, cracks, and seams are gone. How does it save me so much money? It's really simple, and you'll love the outcome. Mr. Gibbs owns a small 5,000 square foot industrial building with a flat built-up roof. One Monday he walks into his lobby to find it a complete wreck. The entire lobby is soaked through the carpet, chairs are sopping wet, and the ceiling tiles have even crumbled all over the floor, and furniture. He calls Robby The Roofer who tells him he’ll be right out to fix the roof. Robby the Roofer comes right out and patches the roof. Mr. Gibbs has all the furniture replaced, and carpet cleaned, and ceiling replaced. The next month, the same thing happens again in another part of the building and he calls Robby the Roofer… and the story goes on like this. Mrs. Jones owns a small 5,000 square foot industrial building with a flat built-up roof. One Monday she walks into her lobby to find it a complete wreck. The entire lobby is soaked through the carpet, chairs are sopping wet, and the ceiling tiles have even crumbled all over the floor, and furniture. Sounds familiar, right? She does some research and calls Steve the Flat Roofing Solutions Guy. Steve the Flat Roofing Solutions guy insulates the roof with spray foam and coats it with silicone – without tearing off the old roof. The Twist: Mrs. Jones saw a return on her investment within 9 years, and made a total profit of $64,250 over 30 years through energy savings.